WASHINGTON (CNN) -- During the most contentious stretch of the Democratic presidential primary campaign last winter, then-candidate Hillary Clinton mocked Barack Obama for his pledge to transcend Washington's entrenched partisanship. President Obama, who won the presidency on a bipartisan platform, now faces a very divided Washington. "Clinton's earlier critique of change has quickly become very valid," said Julian Zelizer, a professor of history and public affairs at Princeton University. "The Washington of George Bush is the same Washington of Barack Obama. The promise of bipartisanship and hope in Washington is difficult to actually achieve." It's the massive $787 billion stimulus bill that has drawn the most criticism -- and praise -- in the president's first month. To be sure, while former president Clinton famously declared an end to the "era of big government" 13 years ago, Obama will herald its return in his speech to a joint session of Congress on Tuesday. Congressional Democrats and Obama supporters argue the new president has admirably taken bold action in response to the dire conditions he inherited, swiftly accomplishing a string of dramatic reforms in a town known to operate at a sluggish pace. Obama has also enacted dramatic Wall Street reforms, salary caps on CEO pay, and a wide-ranging plan to stem the ongoing foreclosure crisis. "This is a presidency on steroids," wrote Eugene Robinson, a liberal columnist for the Washington Post. "Barack Obama's executive actions alone would be enough for any new administration's first month. That the White House also managed to push through Congress a spending bill of unprecedented size and scope ... is little short of astonishing." But scorn from the right is equal to admiration from the left: He championed a new way of doing things in Washington, but Obama went about shepherding his stimulus bill in a very old-fashioned partisan way, Republicans said. That Obama signed the historic measure into law 1,500 miles away from Washington in Denver, Colorado, was a symbol to some of just how much animosity it had stirred up in the nation's capital. "If this is going to be bipartisanship, the country's screwed," Sen. Lindsey Graham, R-South Carolina, declared last week. "I know bipartisanship when I see it." Amidst the passage of Obama's major economic reforms and the country's continued economic turmoil, was a transition process that began smooth but quickly turned rocky after embarrassing revelations regarding several of the president's appointees. Beleaguered by tax issues or charges of impropriety, three of Obama's appointees withdrew their names, including Tom Daschle who would have led the Health and Human Services Department, Nancy Killefer, nominated as a the chief government performance officer, and New Mexico Gov. Bill Richardson, tapped to head the Commerce Department. 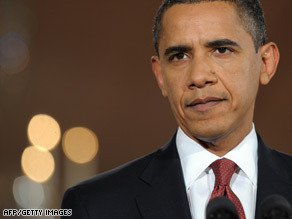 iReport.com: What do you think of Obama so far? A fourth appointee -- Republican Sen. Judd Gregg of New Hampshire -- also withdrew his name for Commerce last week, citing "irresolvable conflicts." Presidents George W. Bush and Bill Clinton each lost one cabinet appointee during their first terms. Presidents Carter, Reagan and the elder Bush lost none during their transition process. Suddenly, a vetting process that was self-proclaimed as the most thorough in history -- and included a 60-page questionnaire -- looked downright amateur. "It raises questions about whether the Obama team did their homework," said David Gergen, an adviser to several former presidents and a CNN contributor. Still, when Obama addresses Congress for the first time, he's certain to highlight that in an extraordinary short amount of time, the new administration has managed to make fundamental imprints on how the government operates -- accomplishments that have taken other presidents years longer to achieve. "Major actions have come out of such a young White House," Zelizer said, "Even though he hasn't been able to get Republicans to join him, that's still a big victory."